The Gallup Poll’s final likely voter poll has proven to be a highly accurate predictor of the results of midterm elections for the House of Representatives. In 13 midterm elections between 1950 and 2006 for which Gallup estimated the preferences of likely voters, the correlation between the Republican margin among likely voters in the final pre-election poll and the actual Republican margin in the national popular vote is an impressive .94. Moreover, the average difference between the predicted Republican vote margin and the actual Republican vote margin in these 13 elections is only 2 percentage points. Given the accuracy of the Gallup’s final likely voter poll in predicting the outcome of the national popular vote for the House of Representatives, it is not surprising that this poll also does a very good job of predicting the division of seats between the parties. The correlation between the Republican margin among likely voters in the final pre-election poll and the number of House seats won by Republicans in the election is .91 which means that the final likely voter poll explains 82 percent of the variation in Republican House seats. Despite the strong relationship between the results of Gallup’s final likely voter poll and the division of seats in the House, we can substantially improve the accuracy of our seat prediction by adding two additional variables to the regression equation: a dummy variable specifying the party of the incumbent president and the number of seats held by Republicans prior to the election. Table 1 displays the results of a regression analysis predicting the total number of Republican House seats based on these three independent variables. All three variables have large and statistically significant effects. The evidence in this table shows that even after controlling for the results of the final likely voter poll, Republicans tend to win more House seats in midterms under Democratic presidents than in midterms under Republican presidents. In addition, the more seats Republicans hold before an election, the more seats they tend to end up with after the election. While more seats generally lead to larger seat losses or smaller seat gains, the end result is still generally more seats in the next Congress. With these two additional independent variables, the accuracy of the prediction is much greater—the regression equation now explains an astonishing 97 percent of the variation in Republican House seats. 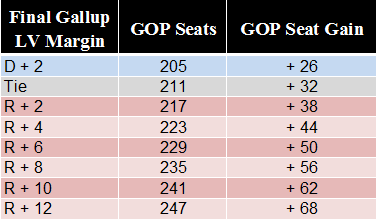 Based on the results of the regression equation in Table 1, we can estimate the number of seats Republicans would be expected to win in the 2010 midterm election depending on the results of Gallup’s final likely voter poll. Those estimates are displayed in Table 2 for a range of possible final likely voter results. The results displayed in Table 2 indicate that in order to win a majority of seats in the House, Republicans will need a lead of 2-3 percentage points in Gallup’s final likely voter poll. A tie among likely voters would leave Democrats with a narrow majority. Gallup will not begin providing polling results for likely voters until October. However, their recent polls have shown an average Republican lead of about 5 percentage points among registered voters which, given the normal Republican turnout advantage in midterm elections and the unusually high level of enthusiasm of Republican voters in this year’s election, should result in a somewhat larger GOP lead among likely voters. Even a 5 point Republican lead among likely voters would be expected to yield about 226 Republican seats, 8 more than the 218 needed for a majority. A 10 point Republican lead among likely voters, which would not be surprising based on a 5 point Republican lead among registered voters, would be expected to yield about 241 Republican seats. That would be an increase of 62 Republican seats. It would also be the largest number of Republicans elected to the House since 1946 when the GOP won 246 seats.